Situated in the middle of the island of Taiwan, the National Library of Public Information occupies a site that is both geographically and metaphorically the confluence of information exploration and urban evolution. The striking form of the building features a “horizontal flow” theme recalling the early irrigation canals in the city’s settlement since the 18th century, as well as symbolizing the fluid data interface in the internet age. Architecturally, the project is strongly rooted in the canons of modern architecture such as Le Corbusier’s Five Points of Modern Architecture; but also addresses conceptual questions such as how the library is to survive or even thrive in the digital age. In fact, the genesis of the design is the decision to directly confront the challenges and opportunities presented by the dynamic nature of digital media. The resulting fluid building form and ever-changing spatial movement are manifested in the protruding volume of the conference center, the grand steps connecting the plaza and the L shaped buildings embracing a landscaped court. 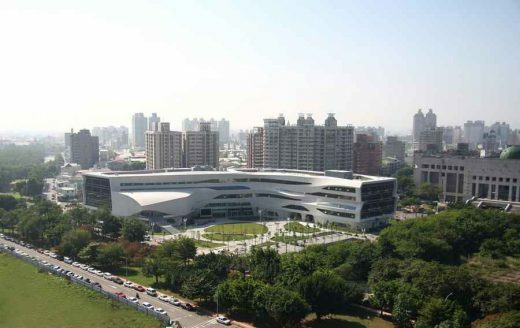 Akin to how the Five Points challenged the conventional design and construction practices of the time, the library tested the limits of design and construction in Taiwan. To achieve the building’s free-formed skin with its curved planes and organic tree trunk-shaped columns, the latest 3D design software and quite a few on-site mock-ups were utilized. In the end, a composite wall system with integrated insulation molds the folding surfaces, which are cladded with pearl-white round mosaic tiles of eight different sizes enabling the skin to achieve a monocoque appearance. In the interior, each floor from level one for five, takes its visual design cue from the corresponding outside view – people, trunk, canopy, the city skyline, and clouds respectively. The landscape design features a moon-gazing berm with a multitude of native plants and low-maintenance wind resistant shrubs. Founded on the balance between cultural, technical and indigenous uniqueness, the design of the National Library of Public Information has established a new model for future civic projects in Taiwan.